When you open Outlook, you will see the avast! AntiSpam toolbar. You will be able to train the avast! AntiSpam toolbar for your exact needs, to save time and effort. There are basically only 3 different types of email, and each has a unique way to be correctly dealt with. When you check your email with Outlook, avast! will automatically check all incoming emails against the SPAM database in the cloud, before carrying out additional heuristics and other checks to identify other potential SPAM. A message *avast spam* will be inserted into the subject line of all suspected SPAM messages, and they will be moved into your “Junk” mail folder. Many of these are from Organized Crime and Terrorists, in an attempt to get you to click on a malicious website so that they may infect your PC. The most common “gotcha” in the USA is the offer of the free iPad. When these are found in your inbox, DO NOT open these emails, as they may contain malicious code, and they “Gotcha” can occur by just opening the email. Best is to highlight the email and click the SPAM button! Notice the top email (below), who is a person I know very well and went to school with. Her name was harvested from Facebook, or gmail, or ??? and sent to me, because I was in her contact list. Notice the email address is not even Patricia’s: deeshollis@yahoo.com. This email is a phishing expedition, and MUST be marked SPAM. This way, it is entered into the Spam / national Blacklist in the cloud. Now avast! will have an opportunity to create a definition / algorithm to try and stop these in the future. These are the emails that we signed up for at some point, and we are now on a distribution list. When solicited emails are no longer desired, it is best to highlight the email, and press the BLACKLIST button on the Spam bar. This will add the sender to your local blacklist, and all emails from this sender will automatically be moved to the “Junk” folder. These is much easier than trying to find out how to unsubscribe from that mail list. Many unscrupulous Webmasters can add you to several different email lists, and the problem gets worse when you “unsubscribe”. So, just mark these emails as BLACKLIST. The worst thing about Spam filters are, when you cannot find the email you’ve been waiting for. You verify again with the sender that they sent the email, and it is still NOT in your Inbox. Now you MUST check your “Junk” mail folder. Sometimes Spam filters will inadvertently grab these emails, and move them to the “Junk” email folder without your knowledge. It is best to monitor your “Junk” folder occasionally to verify that all “Junk” email is in fact, junk. This is rare scenario, but it does occur. If you find email in “junk” folder that you wish to receive, then highlight that email, and select WHITELIST from the Spam bar. This will automatically add the senders email address to your local Whitelist, and you will now always receive email from that sender. The email is now restored to your Inbox. The WHITELIST function will over ride the SPAM button, and will over ride the BLACKLIST button, so it is the most powerful. Regularly check and delete your “Junk” folder, to keep it manageable. Your avast Spam filter can be be configured to auto add all your email recipients to your Whitelist, add your contact list to your Whitelist. The avast! email heuristics can be set to High, to make the Spam filter more aggressive, as well as checking for PUPs (potentially unwanted programs). To accomplish this, open the avast user interface by right clicking the avast! 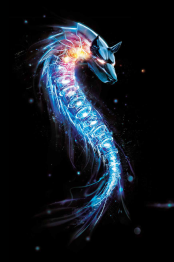 icon, and select “Open avast! …” Real-time shields, Mail shield, Expert settings, Sensitivity, and click the bar graph on the right. also, you can check mark PUP. Occasionally you will notice an email that you previously marked as SPAM, will again appear in your Inbox. When this occurs, it is best to mark that email as BLACKLIST the 2nd time you see it. Now it is on both lists (Spam and Blacklist) and increases your chances of not seeing it again. If you have any further questions about your avast Spam filter, you are welcome to contact me with your concerns. 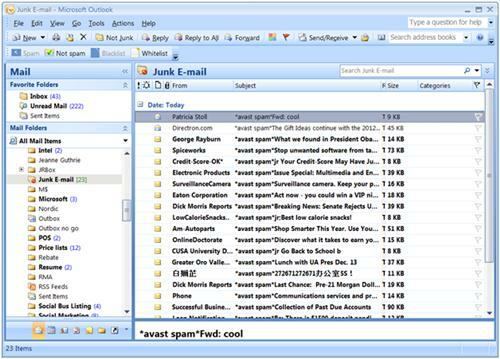 SPAM moves messages to “Junk” and places email in the Spam database at avast! for further analysis, so they get better at it!